Case study interviews tests people in all manners so that the candidate becomes best in terms of action. They are designed to evaluate the process information as this can solve problems and how to react to difficult situations. The topics in case studies can be anything that are mediated and evaluated within a teamwork. Case studies interviews can be presented upon few parameters such as company’s profitability, business intuition etc. Here are some of the examples of case study interviews. The question will be raised as if the clients in the global organization that manufactures and distributes huge range of chocolates will try to expand the business. They can expand either introducing a new channel via the existing distribution or built a complete new business to set many retail stores. So the candidate should answer in such a way that to make this plan successful, the organization has to approach different investments for a better solution. These decisions cannot be taken blindly instead there must be a valid reason behind every decision. Here if the employer asks “How will you manage if there is a declining profitability of an organization?” The employer will expect the candidate to find out a solution and the ways to implement it. So the candidate has to analyze the performance of the entire chain. After identifying the problem, he/she must answer to the question as it is because of the cost effective solution that might make the organization that will address each and every supply chain. The employer may ask “How to introduce a new product in the foreign market?” So the candidate should analyze the risks and benefits in producing the product in his/her own country than in a new country. Also he/she has to verify the terms and policies of the new nation regarding the product. The question may be raised as “If a company has to be restructured, how will you manage it?” So the candidate has to answer that he/she will identify the problems that the company is facing and the ways to address it and also the reasons for the recommendation. Some of the logical questions will be asked by the interviewer. For instance: About the manhole cover. Why is it always in a round shape? The candidate has to answer as if it is square in shape then the cover can fall diagonally as they cannot be dropped directly as manholes. To prepare for the case study interview, the candidate has to understand the firm’s recruitment sample case studies. This type of work can be involved by the other type of work i.e. how the company works with its clients etc. The candidate has to have a glance at the press releases to understand the type of work that the organization undertakes. This will help the candidate to analyze the recommendations, business carried out and also the client’s feedback. Here one can also gather a deep knowledge on the case study interviews by undergoing workshops, presentations etc. As there are two types of case studies, the performance of the candidate will be evaluated. a. Prioritizing the information and developing a hypothesis. b. Developing an exhaustive structure. c. Gathering data that ultimately derives a solution. 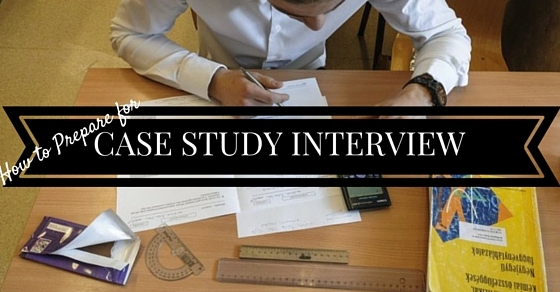 Case study interviews plays an effective role in an interview. It deals with the past and the experiences of sustainability. The solution for each and every problem can be identified on the day to day working of client project. It is obvious that the top consulting firms has a list of valuable advices for approaching the case study interviews. The candidate must be good at analytics and logic of mathematics. Preparing a structured approach towards the problem and focusing more on the issues. The candidate must not outbreak if the answer is unclear. Before answering the candidate must take some time to approach and organize the thoughts. The candidate must try to concentrate and analyze the hints that is given by the employer. The candidate must try to establish a bi-directional communication infront of the interviewer. This rapport conversation will enable the candidate to collect more data for the case study. The relevant information given will be transparent for the thought process and also for the current hypothesis. The interviewer will provide a chart based on the questions. Here are some of the ways to understand the problem. If the candidate is more focused towards the interview preparation then he/she must try to cancel the other events as to focus more on the preparation for the interview. This method maximizes the chances for succeeding in a short period of time. It is advisable to work almost 12-14 hours per day regarding the interview. By restating the question the candidate can confirm the question with the interviewer. To understand the problem better, the candidate must try to rephrase the question in his/her own way. This is done mainly to avoid misunderstandings. Here it is advisable to understand the needs of the customers. Initially the goal must be set to increase the bottom line as to initiate the business. The candidate must try to break the problem into pieces and also to stay focused eventually. This will help in clarifying the goals and to consult periodically. The interviewer expects the candidate to be more attentive about the goals. This will help them come up with different points for the question asked. It is always mandatory to ask few seconds to the interviewer before answering the question. Meanwhile one can prepare the answer and deliver it. While solving the cases the candidate must be analytic and also reasonable. Delivering the answer with the help of issue tree will make the interviewer to understand more about the candidate’s point of view. To state the answer, asking different questions to the interviewer politely about the firm will help the candidate to answer the case study. The candidate must identify the size of company, profitability and the growth that the company achieves and the product that is produced. Regarding external factors the candidate must know the point of lifecycle, configuration and suppliers involved. Regarding the product, the candidate must be aware of the exact product, brand and its corresponding reputation. Generally the interviewer will like to hear the conclusion and later the reason for it. The candidate must have excellent communication while explaining. Even the problem solving skills are analyzed while answering. Creativity and the logical reasoning given by the candidate will strike a note for the interviewer whether to hire the candidate or not. The candidate can impress the interviewer by generating actionable recommendations. Some of the candidates fail due to improper structuring of answer. This method has to be followed throughout the preparation for the interview. Most of the candidates fail due to improper delivery of answers to the employer, so this process of taking notes will help the candidate to process the information by understanding, referring and remembering the structure of answer. The interviewer will give necessary information to solve the question. So the candidate must try to gather the information, organize it and must be able to find a solution by performing data analysis. It is more important to demonstrate the reason for answer given. Before analyzing the candidate must paraphrase the answer. The candidate must be an active listener and must focus and concentrate on the information or the question asked. To proceed further, he/she must write the points clearly as it becomes a structure for the answer. Each and every piece of information has to be analyzed. Always listing possible solutions will help the candidate to understand the reviews that are mentioned and the problems that is focused. Planning for a solution and listing the hypotheses will develop creativity which in turn will help to identify more answers. To identify a best feasible solution the person has to enquire about the company to the interviewer. Analyzing and gathering information about the real life challenges that the company faces will help the candidate to provide more structured decisions. It also creates a bridge between the frequent happenings and also the high level programs. This framework has to modulate the answers in various categories that the structure is made. To construct a framework, the candidate must create critical solutions for the sample cases. These can be included from the marketing business and also depending upon the situation that are encountered by the organization. Making use of the websites and resources to provide good answers in the interviews is the agreed techniques by the experts. Assessing the cases by receiving help from the experts is important. Remembering the interview process and preparing accordingly is smarter technique. Building a graphic representation will enhance the analysis of parameters, other influencing factors and also the decisions. The recommendations of strong argument have to be made as this approach has an added benefit for the preparation. The candidate must be aware of the strengths and weaknesses. This will help them to evaluate the master of other consulting frameworks. The answers will be more specified in time as it becomes the relevant data. This will help them to determine the frameworks that are set at finding a complete solution. It will be more effective if the candidate mocks the interview by undertaking fruitful efforts. Thinking more about the areas of improvement will help to clear the interview. Working more on the negative feedback will help in defining more about the goals as this becomes an evaluation for strengths and weakness. The candidate must collect details as to ask some intelligent questions to the interviewer. This can be done by preparing for the additional information as this may clarify the doubts while going in a wrong path. Candidate must be aware of the general incidents that happen all over. He/she must stay updated about the issues. For the sake of reference the candidate can go through the news about international affairs, politics etc. As we are all aware of the fact that each interview will be composed of few of the quantitative questions, one should focus more on those. Actual case interviews will focus mainly on the numerical abilities. Data interpretation, self awareness identity are the most expected questions in a case interview. There are many websites and plenty of books to go through before attending the interview. Candidates can gain confidence solving the sample case questions. This will help to create a structured answer and also help them to understand the questions. Thus, by preplanning and practicing the sample cases one can mock the case interview easily. Regardless of the cases one can consider few parameters such ability to analyze the situation, identifying the exact issues and answering.